Jean-François Lyotard was one of the most influential European thinkers in recent decades. He was a leading participant in debates about post-modernism and the decline of Marxism, and he made important contributions to ethics, aesthetics and political philosophy. 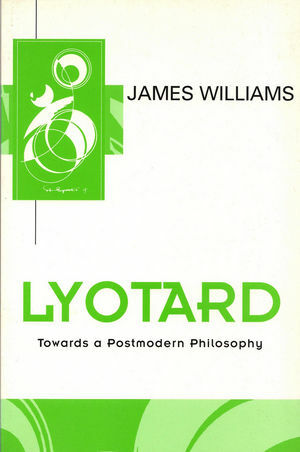 In this authoritative introduction, Williams tracks the development of Lyotard's thought from his early writings on the libidinal economy to his more recent work on the post-modern condition. Williams argues that despite the wide-ranging character of Lyotard's writings, they are animated by a long-standing concern to develop a new theory of political action. Lyotard's productive use of avant-garde art and the aesthetics of the sublime are interpreted within this context. In the final chapters some of the main criticisms that have been levelled at Lyotard's work are outlined and assessed. A challenging but also accessible book, it will be welcomed by students and researchers in continental philosophy, literary theory and the humanities generally. James Williams is Lecturer in Philosophy at the University of Dundee. 1. Introduction: Rethinking the Political. 3. States of Society: The Postmodern Condition. 4. States of Society: The Libidinal Economy. 7. Hegel, Levinas and Capital. * Critical analysis of the work of one of the most influential philosophers in recent decades. * Gives particular attention to Lyotard's writings on postmodernism, which have been particularly influential. * Establishes the importance of Lyotard's contribution to the fields of both philosophy and literary theory; includes an examination of his work on ethics, aesthetics, political philosophy, as well as his thoughts on the debate about postmodernism and the decline of Marxism.